Going to visit people in their homes and offices to look at and pick up collections is a fairly regular occurrence around here. We like to think of them as archival field trips! We had one of those today, but this one was a little different than our normal trips. 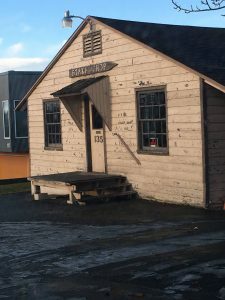 Sunday I received an email about a building up for sale downtown. It was the Stake Shop, a company that had supplied yard signs to quite a few political candidates over the years. 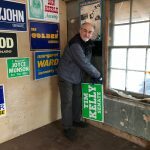 One of our long-time supporters had walked by the building and noticed that it was up for sale and also spotted that there were quite a few political signs on the walls still and he worried that whoever bought the property might tear down the building and the signs with it. “Could those maybe be rescued?” came the call. Signs along one wall in the front room of the Stake Shop. I got in touch with a realtor friend to find out which realtor was handling the property and that realtor was kind enough to get us contact information for the owners. I met with them on Monday to take a look at the signs and see if they were something we might want to take in. There weren’t a huge number of them, probably 75-100. 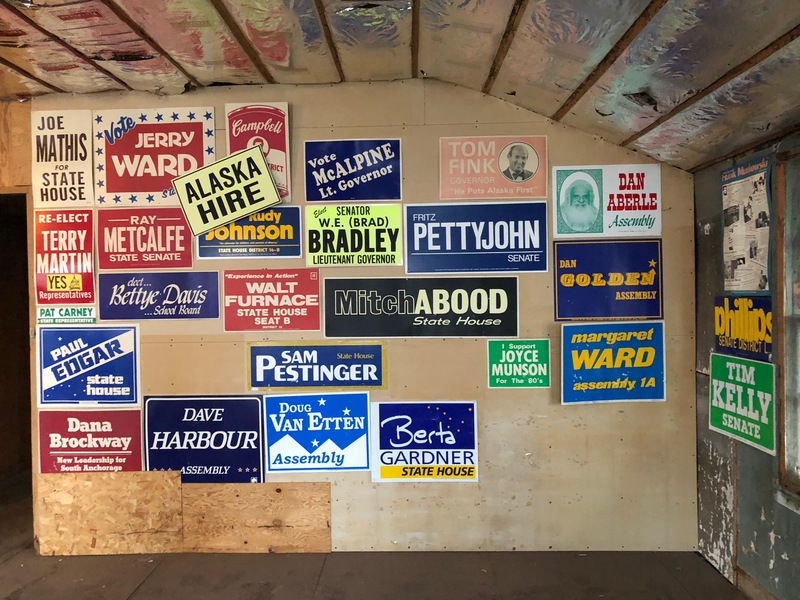 Since many of them reflected campaigns and candidates that aren’t otherwise easily found in the archival record–not to mention pretty good visuals for what makes an effective yard sign and trends in graphic design!–I thought it was important to preserve them and make them accessible. During my Monday visit I got a closer look at what we might do about taking them in. And then I set up an appointment for Tuesday for us to come pull them off the walls. The signs were all stapled to the walls with heavy duty staples. 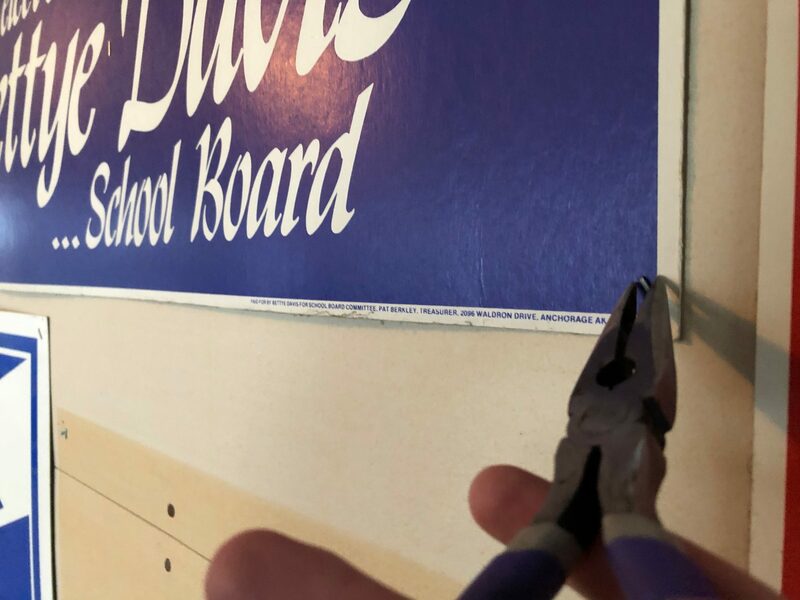 Pulling staples from a Bettye Davis school board campaign sign. Since this was going to be a little more labor intensive than our normal stepping and fetching of boxes of records, and would require some ladder climbing to reach the higher signs, I asked around the Consortium Library for some help. And we got a few volunteers and they even brought their own tools! 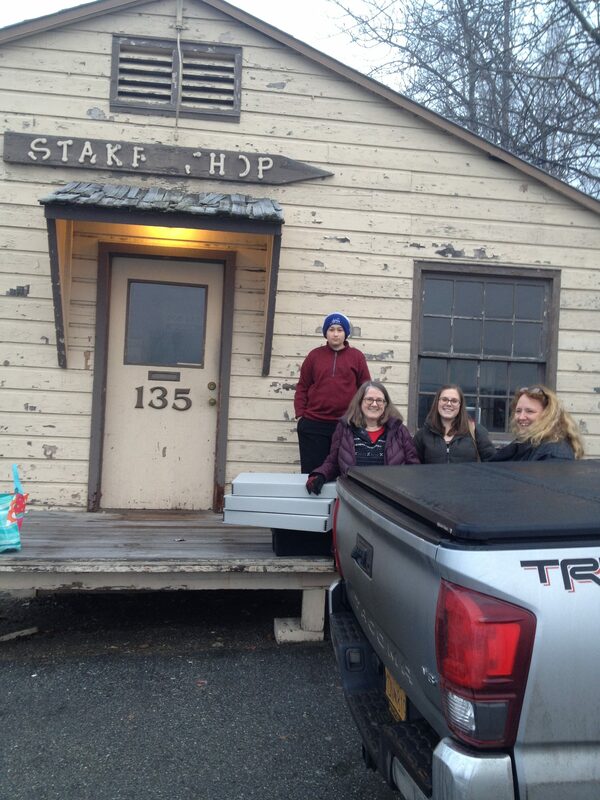 Sam, Sigrid, Veronica, and Arlene ready for some work! One of the many ways our Library Dean supports the Archives. Volunteer (volunteered?) labor! Sam pulling staples. Sigrid from the Alaska Medical Library helped out too! Thanks to Don Mitchell and Ian Hartman for watching out for the history of our community and bringing the signs to our attention. Thanks to Michele Miller and Lynda Zaugg for fielding what might have been some of the strangest emails/texts realtors might get regarding a property up for sale. 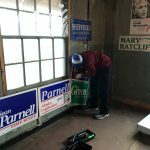 Thanks to Steve and Sam Rollins, Veronica Denison, Kevin Tripp, and Sigrid Brudie for being a part of the sign take-down party. 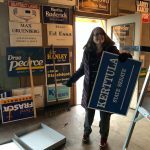 And extra special thanks to Jerry and Louise Hagel, owners of the Stake Shop, for preserving and displaying these signs for so long and for being willing to donate them to the Consortium Library to be added to our political memorabilia collection. And here’s what the walls looked like after we took down the signs. 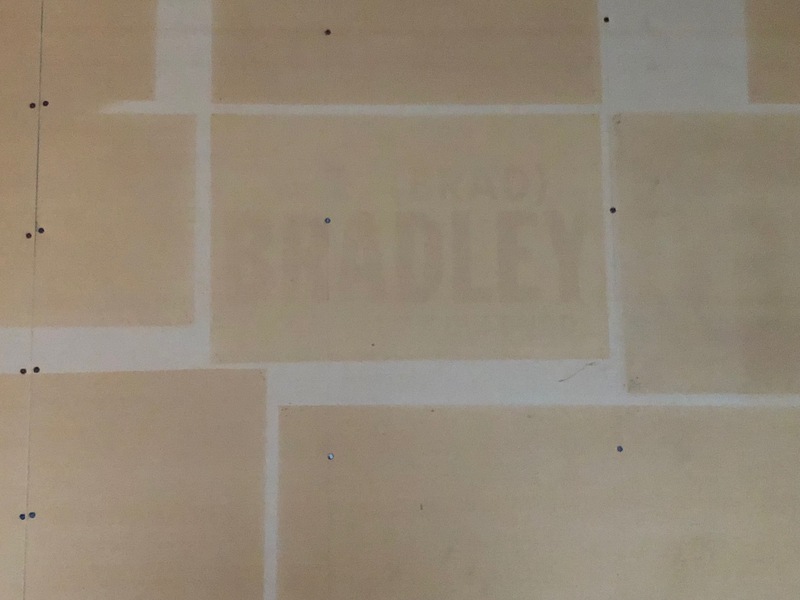 It’s not a bad visual for what years of light exposure can do to painted walls. And if you look really closely, you can see how the lettering on the signs had an effect, too.